nine + = 11 Required Please enter the correct value. The Internet of Things (IoT) is no longer a secret. In fact, by the end of 2016, 62% of Americans owned at least one IoT-connected device. And while the tech "spotlight" may be on IoT investments, we've found three IoT stocks (one that's completely under the radar) with tremendous profit potential. 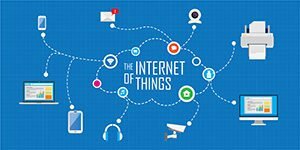 IoT refers to any piece of technology that has the ability to connect to the Internet and/or another IoT device, including cell phones, coffee makers, headphones, and wearable devices like smart watches. There are 7.6 billion people on Earth, and our population is only estimated to reach that 11.2 billion number by 2100. By 2020, the number of IoT-connected machines is expected to reach 30 billion devices and $3 trillion in spending, according to the International Data Corporation. That $3 trillion in spending will create a massive profit opportunity for a select group of tech stocks. Nvidia Corp. (Nasdaq: NVDA) is well-known as a CPU and GPU maker. CPUs are essentially the brains of computers. GPUs are specialized chips for rendering images, animations, and video for computer screens. GPUs are critical for artificial intelligence platforms that make the Internet of Things useful, and Nvidia supplies the technology they require. In March, Arm Holdings, a software-design company, chose to integrate Nvidia's Deep Learning Accelerator architecture into its Project Trillium platform. This platform aims to connect 1 trillion IoT devices. Nvidia is essentially helping IoT chipmakers incorporate AI into their products. If successful, NVDA's GPUs specializing in AI could be purchased by even more companies. That means more revenue for the company and profits in your pocket. Analysts have an average price target of $275.57 on NVDA shares, which represents 11% upside from here. That may be conservative. With a Money Morning Stock VQScore™ of 3.45, Nvidia has solid financial footing. The company increased its net income 83% from $1.66 billion to $3.05 billion from January 2017 to January 2018. Analysts expect NVDA to increase earnings another 58% this year and anticipate a jump of 34% for revenue year over year. As a long-term investment, any dip in the NVDA stock price should be viewed as a buying opportunity. A second play on the IoT market is Marvell Technology Group Ltd. (Nasdaq: MRVL). MRVL specializes in data storage, network infrastructure, and wireless-connectivity solutions, all necessary for the Internet of Things to work. We like Marvell because it recently opened an electromagnetic compatibility (EMC) lab to implement its cloud IoT technology on the connected-car industry. MRVL is using the EMC lab to build a portfolio of connectivity chips that target fast-growing automotive applications. Over 125 million cars with embedded connectivity will be purchased over the next five years, according to Counterpoint Research. Marvell recently created an automotive-connectivity product equipped with Wi-Fi and Bluetooth, allowing two independent multimedia streams of data to run simultaneously without compromising bandwidth. Analysts have an average price target of $27.27 on MRVL shares, which represents 26% upside from here. With a VQScore of 3.75, Marvel is a solid buy with room left to run to the upside. While both of those companies are excellent ways to play the industry, this next play has by far the highest profit potential. MU has been trading between $50-$60 a share since March. Not seeing the 52% increase based on Analysts estimates of $52.50. I think this report was originally written in January.